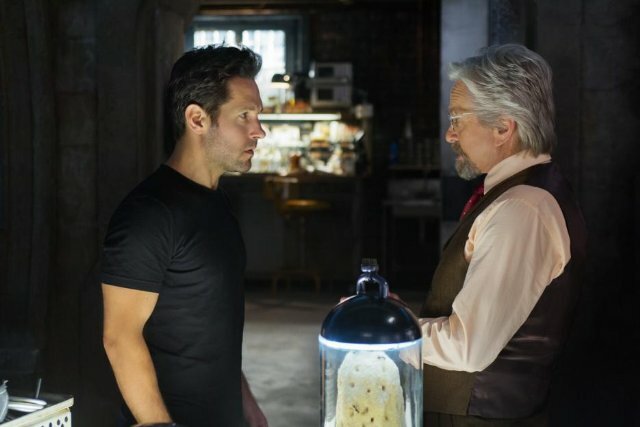 Scott Lang (Paul Rudd) and Dr. Hank Pym (Michael Douglas) in Ant-Man. Although based around their smallest comic book hero, Ant-Man is one of the most fun and lighthearted entries into the Marvel Cinematic Universe. For a superhero blockbuster, that arrives amidst a summer of options in the genre, the film provides breezy entertainment, an origin story that sets out simply to have fun establishing its characters, and there’s something refreshing about that. Scott Lang (Paul Rudd) is a modern Robin Hood of sorts, who has just gotten out of jail for robbing millions of dollars from a sleazy company, and giving it back to the people. Although desperate to get back on track and regain visitation of his young daughter (Abby Ryder Fortson), as well as earn back the trust of his ex-wife (Judy Greer) and her new police officer husband (Bobby Cannavale), he is tempted by his buddy Luis (Michael Peña) to pull off one last job. This takes him to Dr. Hank Pym (Michael Douglas), a scientist who has developed a technologically advanced suit that allows the wearer to shrink down to the size of an ant and communicate with the insects. The secret formula for these “Pym Particles” has fallen into the hands of Darren Cross (Corey Stoll), an unscrupulous corporatist who plans to weaponize the technology and sell it to the military for his own personal gain, through the Yellowjacket program. Their goal is to break into his heavily guarded laboratory, where Hank Pym’s daughter (Evangeline Lilly) works as a double agent, and steal back the plans. With Scott Lang donning the incredible shrinking suit, and getting the hang of it through some funny training montages, much of the narrative involves their heist on this high-tech facility. At times, it’s admittedly a little hard to watch the film without wondering what it might have looked like if co-writer Edgar Wright had remained on the project as director. But Peyton Reed does a fine job behind the camera, bringing a deft comedic touch that allows the film to play around with its characters and their placement in the much larger world of this series. This is Marvel having fun with its mythology, and this lighter approach and smaller scope is actually refreshing and helps with character development, especially in contrast to the overblown battles of the recent Avengers: Age of Ultron. Much of the action here feels inventive and fresh, playing around with size and scope in ways that range from amusing to exciting, often at the same time. The climactic battle, staged in a child’s bedroom and making full use of a Thomas the Tank Engine model train, is a perfect example of the clever ways that Ant-Man uses its superhero as a plaything. A big part of the film’s success also belongs to Paul Rudd, who is completely game in the title role, infusing the character with his signature brand of immense charm and genuine likeability. Michael Douglas also seems to be having a lot of fun, and Michael Peña provides even more comic relief in his memorable supporting role as the partner in crime. This might not be the best film in the Marvel Cinematic Universe, those honours still go to the first Iron Man and last year’s exceptional double hitter of Captain America: The Winter Soldier and Guardians of the Galaxy. But Ant-Man is probably their flat-out funniest film yet, and one of the most purely enjoyable pieces of this much larger machine, playing as a comedic heist film first and foremost, and being very entertaining at that. It’s simply a lot of fun, and stick around for the two end credits scenes, which have exciting implications for the rest of the series. Marvel for the most part has had a good track record at making solid Summer entertainment. The risk they run however is finding fresh ways to tell their stories and not feel like just a copy of themselves. By continually introducing new characters and bringing in new directors to flow new styles into the mix they have often found success. Ant-Man is one of those successes. Paul Rudd plays Scott Lang, a cat burglar who specializes in stealing from people who ‘have it coming’ usually due to their attitudes and rich elitism. 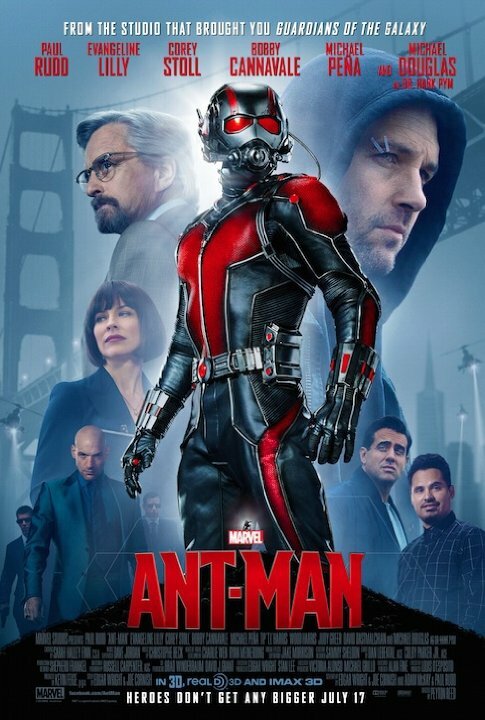 His moral criminal code attracts the attention of Dr. Hank Pym (Michael Douglas) who is struggling to stop Darren Cross (Corey Stoll) who has forced him out of his own company and is on the verge of creating a technology that could have dangerous military consequences on the entire world. For those who know the comics Dr. Pym has created the Pym particle which gives the ability for the user to shrink to the size of an ant, and have the strength-to-weight ratio that comes with it. Faced with a decision between staying in jail and being recruited to become the Ant-Man, Scott Lang finds himself on the side of the good guys for once and finally may just be able to prove that he is worthy of being a good father to his young daughter (Abby Ryder Fortson). The film follows a classic origin story set-up, but it does it with humour, a likeable lead in Paul Rudd, and fun action sequences befitting of a Summer blockbuster, while also keeping the body count low. There are also some clever references to films such as Avengers: Age of Ultron that feel intentional in a very meta way. There are also some great cross-overs with characters from previous films that blend in perfectly and set-up for Ant-Man to join in by the time Civil War rolls around. With the feel at times of a heist, action, and comedy film, Ant-Man is an all-round enjoyable piece of entertainment that still keeps itself grounded in the development of its main characters. Ant-Man is the latest Marvel film, about the origins of the character embodied by Scott Lang (Paul Rudd), a burgler who finds himself with a stolen suit that shrinks him down to insect size while enhancing his strength. Dr. Hank Pym (Michael Douglas) had developed the suit technology in the 1980s, but hid his findings out of fear they would be misused. Former assistant Darren Cross (Corey Stoll) forced him into retirement and took over his company, managing to redevelop the technology into a tiny weaponized force ready to sell to the two-fisted salute folks. Pym’s supposedly estranged daughter Hope (Evangeline Lilly) is Cross’s trusted assistant, but really hopes to help her father stop him. Scott has a daughter, Cassie (Abby Ryder Fortson), in the custody of his ex-wife and her new spouse (Judy Greer and Bobby Cannavale). Facing further imprisonment that will keep him away from Cassie, Scott agrees to don the suit and help the Pyms, along with his own partners in crime (Michael Peña, David Dastmaschian and T.I. ), and armies of specialized trained ants. Co-written by Edgar Wright and directed by Peyton Reed who is better known for comedies, Ant-Man inevitably doesn’t take itself too seriously, which makes Paul Rudd perfect for the title role. The witty script well served by the fine cast helps lighten the serious if far-fetched story, with lots of suspense and spectacular action sequences. The special effects alternating between regular and shrunk scales are brilliant. In summary, Ant Man is one of the best Marvel films to date.